Citrus growing regions such as Florida, California, Texas and Arizona have strict regulations in place to ensure that citrus trees are tested for pathogens to verify that they are free of disease before they are sold. ‘Mother’ trees and increase trees that provide budwood for tree production are kept in screened or solid structures that protect them from disease-carrying psyllids. USDA and state programs inspect these protective structures to make sure there are no breaches. 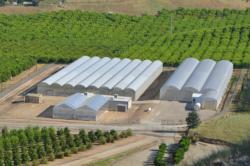 In California, insecticides are applied to citrus trees in production nurseries before they are shipped to retail nurseries in order to prevent establishment of psyllids once the trees reach a retailer. Transport of citrus between citrus growing states and countries is prohibited to help prevent spread of huanglongbing. To introduce new citrus varieties, organizations such as the Citrus Clonal Protection Program (CCPP) and the USDA germplasm repository provide methods for safe importation of budwood and pathogen elimination using heat therapy or shoot tip grafting to create ‘clean’ plant material. In spite of these protections, the general public does not always understand their importance, and sometimes unknowingly brings diseased budwood or plants into the US.